I have started painting for fun. As a way to play, be creative, and to practice focusing on the process. I literally buy cheap canvases and acrylic paint from stores like Tiger and Søstrene Greene. Sometimes I paint with my kids, but mostly alone. It's lovely. I enjoy it so much. And I'm paying attention to how I feel while I paint. It is truly just meant to be a fun home project. But the truth is, it is hard not to get caught up in how the painting looks, and what other people think of it. The more I paint, the higher the expectations I have for the result. You might think to yourself, that's normal and how it should be. And in a sense, you'd be right. It's definitely my default thinking. And probably most people's. But as my expectations get higher, my joy for painting gets lower. And then it becomes harder to stop whatever it is I'm meant to be doing, and go out on my balcony, where I have my "atelier" and play with colors. So that's when I stop. Because I'm a (recovering) raving perfectionist, this is a classic pattern for me. And it's what just happened to me. Luckily, I know a bit about how a creative process works. And I'm getting more knowledgeable about my own creative process, so I recognized what happened. So yesterday I sat myself down and did a little more painting. Ha! Take that, high expectations!! 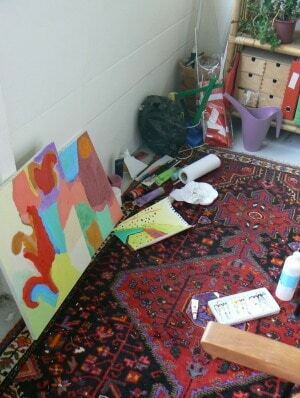 And I thoroughly enjoyed the time I spend "playing with paint" (as I call it). This experience isn't just classic for me. 85% of us give up on our creative interest/intention/dream/expression. That's crazy pants. Really, it is. Don't you think so? And what is frustratingly crazy, is that it doesn't have to be that way at all. With even a little knowledge about what happens in a creative process, especially your own will mean you won't give up, but enjoy a creative life. We're not talking about being able to create artwork that will be sold at Sotheby's. We're talking about you, living a creative and joyful life. It doesn't matter what you're into now or will be into in the future. What matters is, that you enjoy expressing yourself creatively. And that's actually huge and comes with all kinds of benefits, both emotionally and physically and it doesn't just include you, but those around you too. I'll get into that in next weeks blog post. Make sure you're signed up to my email list so you won't miss that post about these fringe benefits.